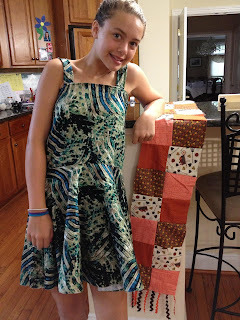 Pieced Brain: More sewists in the family! More sewists in the family! Her mom told me even the dog is wearing her creations! This budding sew-aholic went to sewing camp this Summer and made 2 dresses (pictured on right and below), two skirts, a horse saddle, a pocketbook, stuffed animals, and many other small projects. How wonderful to be able to start sewing this early in life. When I was about 8 my mom taught me how to make doll diapers using her sewing machine and old bed sheets. As a young adult I took sewing lessons from seamstresses in Brazil. 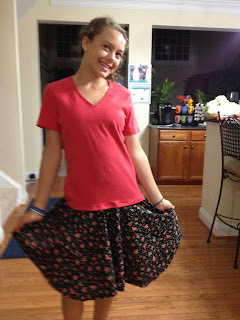 However, after making a dress, a jumpsuit, and an apron I realized sewing clothes was not for me. Many years later, when I decided to learn how to quilt, I got my old Singer out of the closet (sewing with that machine lasted only one week once I laid eyes on Berninas...) and the rest is history! How fun! When I was 13, my mom shipped me off to the Singer Sewing School because she "didn't have the patience to teach one more daughter how to sew." The funny thing is she only has two daughters! I think she knew I was so impatient that she didn't want to teach ME how to sew. But that summer at Singer was the best gift ever. I can't even imagine my life without a needle and thread!